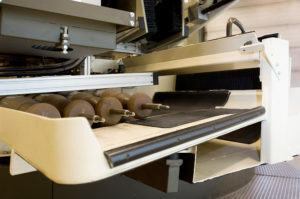 High fidelity loading trainer systems from MSE. Live situations are all about stress, communication and most of all skill in the handling of ammunition and the actual moment of loading. Repetitive training is a necessity in order to maintain and develop a high degree of ability. Training skills in a simulator is both economical and accessible. Loading trainers from MSE can be adapted to various types of weapon systems used in combat vehicles and artillery. 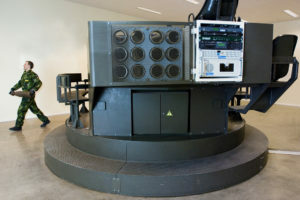 The trainer is constructed using exact replicas or actual parts of the live weapons system and therefore is as close to the real thing as it is possible to achieve. 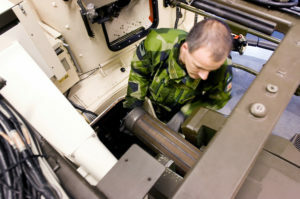 It is important that all the details in the weapons system, including the ammunition, are realistic so that the soldiers feel familiar and act in the same way as on the live system. The trainers simulates both recoil and the ejection and separation of ammunition. The loading trainers can either be installed as embedded in a container, separate in a building or combined with a turret trainer. The latter gives the possibility for a tank crew - commander, gunner and loader - to train their ability to work together as a team. It also means that every step from giving of orders to actual firing can be trained in an environment where the instructor has an excellent overview and can easily evaluate the exercise. A mobile installation creates the opportunity to train different units at different locations, which gives a high degree of usage of the trainer. MSE loading trainers creates significant opportunities for evaluating the ability and skills of the loader. All steps are registered, e.g. speed, choice of ammunition and communication. Statistics can be generated providing valuable feedback.